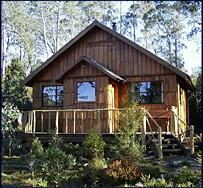 Cradle Mountain Highlanders offers secluded wilderness cabin accommodation on the edge of Cradle Mountain National Park. There are twelve self-contained wilderness cabins nestled in temperate rainforest on this 10 acre property which enjoys a stunning view of Cradle Mountain. Cradle Mountain Highlanders is two minutes drive from the entrance to Cradle Mountain National Park and 200 metres from the Cradle Information Centre and Shuttle Bus Terminal. 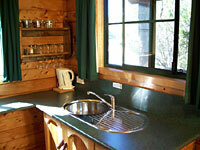 Natural timber glows and gleams inside the well-appointed wilderness cabins of Cradle Mountain Highlanders. All wilderness cabins have fully equipped kitchens, private decks or verandahs, television, clock radio, electric blankets, hair dryers and pure Tasmanian mountain water on tap. Eight of the wilderness cabins have romantic log fires and two have spa baths. Portable barbeques can be set up on your deck or verandah and there is a guest laundry. Continental breakfast baskets are available and there are restaurants within two kilometres of Cradle Mountain Highlanders. With wildlife at your doorstep, spectacular alpine scenery all around and a rustic mountain cabin to call home, you will really feel at one with nature when you make Cradle Mountain Highlanders your base for exploring the World Heritage listed Cradle Mountain Lake St Clair National Park. Rates are for 2 people. Maximum occupancy is for 4 people. Rates are for 2 people. Max capacity is for 4 people. Extra guest is $20 child, $30 adult. Open plan cabin with Queen bed, log fire, well equipped kitchen and spacious bathroom with corner spa. Also has a separate bedroom with another Queen-sized bed. Rates are for 2 people. Maximum occupancy is for 2 people. Open plan cabin with romantic Queen-sized bush pole bed, log fire, well equipped kitchen and spacious bathroom with corner spa. Rates are for 2 people. Maximum occupancy is for 2 people. 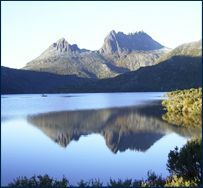 Spacious open plan cottage for two with log fire and views of Cradle Mountain. Luxury bathroom features walk-in shower, heated tiles and rectangular 2 person spa bath.